In the first three posts of building a rule engine in c# building a rule engine in c#, building a rule engine in c# (part 2: extending the rule engine to handle collections), building a rule engine in c# (part 3: extending the rule engine to handle aggregations of collections) the definition of the rules are very basic and did not look very clear. So i decided to implement an expression evaluator. With this expression evaluator the definition of the rules becomes much clearer. I will show the difference in the next three pictures. The first one shows the definition of the rules how i described it in the past three posts. This second picture shows the definition with a expression evaluator. If we use a expression evaluator we can also use logical combinators (and, or) to combine the defined rules. The third picture shows how the processing rules would look like if they are combined. Now the defined rule text (” (Children = 2 && Married = true) || Age > 36 “) is evaluated against the defined person object. The evaluatorResult is true because the person object has two children and is married. Here is a second example that shows that it is possible to use properties at any possition in the rule text. The evaluatorResult is also true because Age / 20 is smaller than Children and the name is unequal ‘test’. If you want to use the expression evaluation engine you can download it from codeplex (https://simpleexpeval.codeplex.com/) and add a reference in your visual studio project. 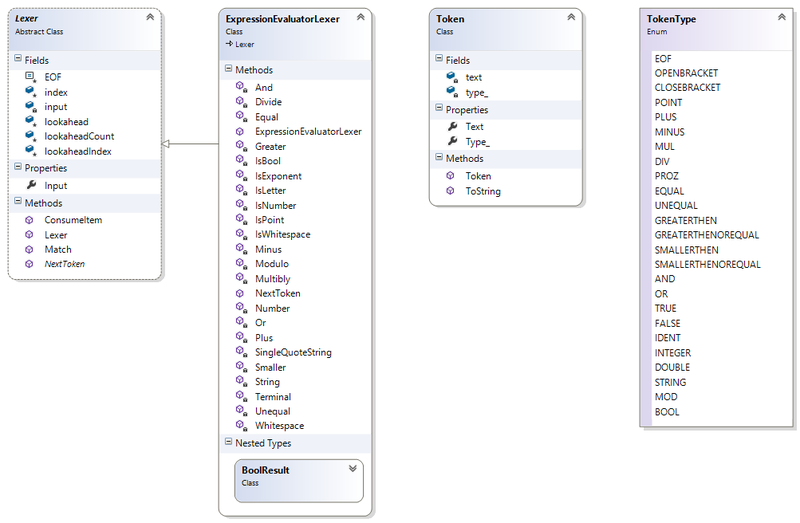 Then you can use the Evaluator class to evaluate the defined rule text against an overtaken object. 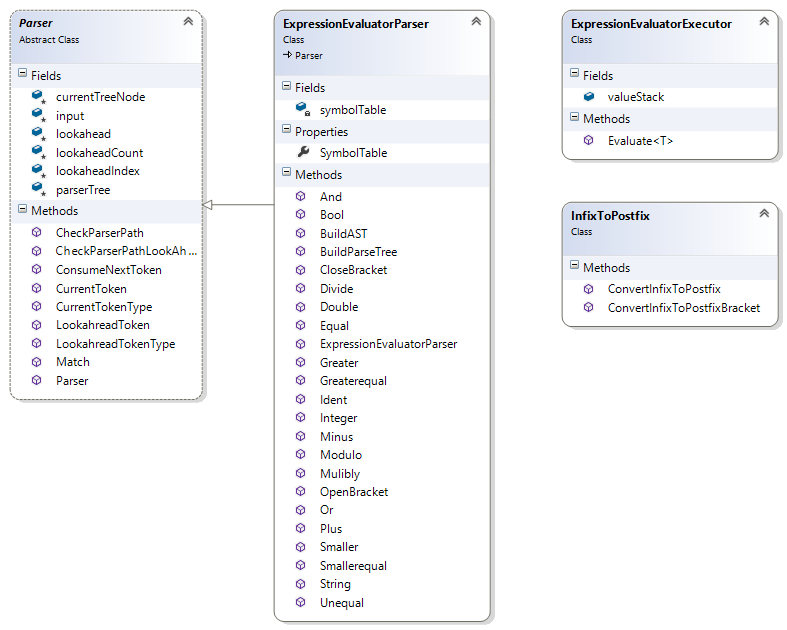 In the blog post implementing an expression evaluator in c# i describe the implementation of the expression evaluator and in the post building a rule engine in c# (part 5: bringing it all together) i try to give an overview of the usage of the ruleengine.codeplex.com project. The idea behind this post is the generation of regular expressions. After writing a regular regular expression i read a book about data structures. In this book the author writes about implementing a regular expression parser with the help of a state maschine. The basic idea is to build a state maschine out of the regex expression, and then let the regex text flow through that state machine. If the text passes the state machine it corresponds with the regex expression, if not it throws an error. That principle can be transformed to a simple custom language. So in this post i first will show how to implement a subset of the regular expressions. In a second post i will describe the implementation of the RegexToStateMachine project. Then i will show how to transform a custom language that has control commands to send and receive data to a state machine. This control commands will be parsed and checked with the generated state maschine. First we have to think about how we could build a dynamic state machine out of a given set of characters. That is very simple. We parse each character and build a State object for it and we build a state transition from the current state to the next state. If we do so we get a state maschine where we have only one state transition from one state to another state. Now we have the text “aabba”, that text would flow through that state maschine and would throw now error. Every other text would fail and throw an error. But what is with regular expressions that contains repeating. For example the following expression. If we want a state machine that works for such a regular expression we need a different state transition. The following graphic shows how that state transition has to look. The state * has a jump back to the previous character. If we have the text “aaaaa” it would work with that state machine. But what is with the following regular expression. For that expression the state machine has to look like the one on that following graphic. So we need to include a jump back to the last open bracket. . If we have the text “abcabcabc” it would work with that state machine. Now we have to check how the | operator that stands for logical or works. If we have the following regular expression. We need the following state machine with the following transitions. So the state machine has to jump to the next character behind the pipe operator. . If we have a program that can dynamical build a state machine for all that operations we have to ensure that we can combine all that operations so that the following regular expression would also work. 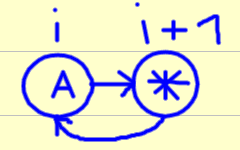 The following graphic shows the state machine that combines the or (|) operation with the repeat (*) operation. As we see there are many texts that would fit that regular espression. For example “abab” or “efefef”. Now we have definied the operations for the regular expression to state machine parser. So with this transformations we now know how the state machine has to look for the defined commands. What we now need is a program that converts the expression in the corresponding state machine and checks if a given text flows through the generated state machine. The description of a possible implementation is shown in the second part of that post series. The source code is available at RegexToStateMachine. 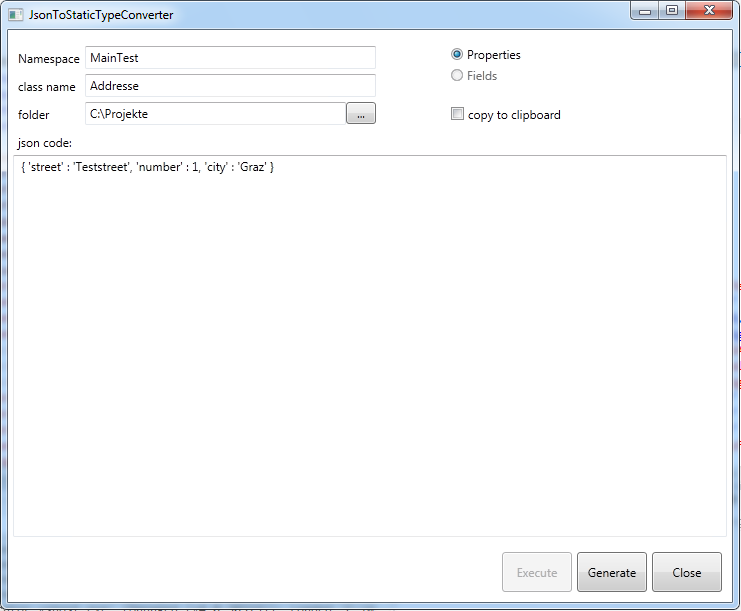 In this post i will write about the JsonToStaticTypeConverter project and how to use it. I created that project after implementing a Json parser. After finishing the parser i thought about where i could use this. So the result is an application that can generate c# classes out of a Json string. So with the JsonToStaticTypeConverter you can generate c# classes and fill them with your Json data. This c# file is inserted into the solution that wants to process the Json data. Here we see how the JsonConverter is used to generate the static structure of Addresse out of the Json data. We also need to reference the JsonConverter.dll from the JsonToStaticTypeConverter Project. Therefore we use the Deserialize method and overtake the Json string. So with the JsonConverter it is possible to use the Json data due to a static structure. In the second post of this series i will write about the implementation of JsonToStaticTypeConverter and about the implementation of the Json ParserCombinator.